Science Park, Hong Kong - O2O technology developer ConnectAR has released SnapPop 1.1, an important update to the crowdsourced image search app for iPhones, iOS, and Android devices. Using SnapPop, anyone can interact with their surrounding environments by simply snapping a photo of a poster, billboard, business card, product packaging, or other materials, and SnapPop will quickly deliver related multimedia or AR (Augmented Reality), right on their smartphones. SnapPop 1.1 users can attach their singing video to any of the four US 2017 Christmas Carols themed stamps, so that other SnapPop users who snap or scan can discover it. Besides singing, users can also upload a video of loved ones, or them dancing to the Christmas Carols. 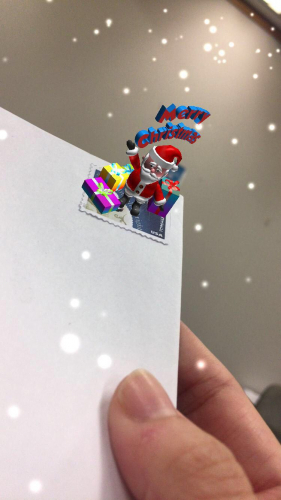 With four songs as this year's theme -- Silent Night, Jingle Bells, Jolly Old Saint Nicholas, and Deck the Halls -- SnapPop users who scan the stamps will hear those Christmas songs, or watch a video of the song, while also seeing a virtual 3D Santa waving while standing on top of the stamp. Recipients of the stamp -- even if located in Hawaii, Florida, or Australia -- will be able to see it snowing on the stamp when using SnapPop's Augmented Reality (AR) mode. 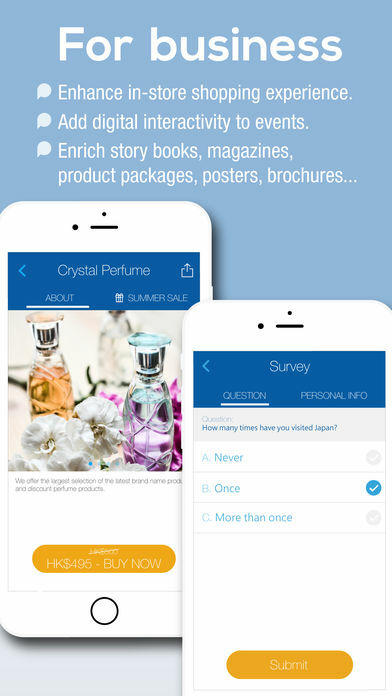 "SnapPop allows anyone to use their smartphones’ built-in camera to interact with printed materials such as product packaging, magazines, ads, posters, and more. The typical interactions through SnapPop are already rich in variety, e.g. entering a lucky draw, viewing videos, taking selfies, play AR games, to name a few," says ConnectAR COO Ricky Lui. "But for the 2017 holiday season, we would like to celebrate Christmas by taking this year's US Christmas Carols stamps, and sprinkling some digital magic dust on them. Furthermore, we want to get the global community involved to 'attach' more holiday spirited videos and songs onto these stamps." Using SnapPop is literally a snap. Simply snap a photo of a package, a page from a magazine, or even a business card. SnapPop goes to work, and searches for a matching "pop" in its extensive cloud-based image database. If a match is found, the user can then access other users' videos or other contents. This allows everyone to share their opinions and other information about products, magazines, books, movies, products, and more, while finding out what others have to say about the same subjects. The user can then leave their comments, sharing them with everyone, or only friends. If no match is found, a new entry can be made, and an audio message can be shared, along with other information. Looking beyond stamps, SnapPop is also working on collaborations with children's book publishers, as well as brands and products. * Get sneak peeks of interesting content with just a quick scan of a book cover. * Stay updated on products they're interested in. "SnapPop is the first crowdsourcing platform designed to facilitate near-realtime creation and consumption for linkages between physical world and digital world using images," said Leo Lau, CEO of ConnectAR. "In other words, a user can use the camera as his/her eyes, and SnapPop as his/her extended intelligence, and rely on SnapPop to retrieve relevant and interesting information in just seconds!" SnapPop 1.1 is free, and available worldwide through the App Store and Google Play in the Lifestyle category. All Material and Software Copyright (C) 2017 ConnectAR Ltd. All Rights Reserved. Apple, the Apple logo, iPhone, iPad and iPod are registered trademarks of Apple Inc. in the U.S. and/or other countries. Android is a trademark of Google LLC. Based in Hong Kong, ConnectAR Limited helps its customers actualize tremendous business opportunities in the smartphone era. ConnectAR has developed cross-platform mobile phone AR (Augmented Reality) software, such as iPhone/iPad and Android apps, and related cloud based systems. The company leverages its experiences in AR and their founders' experiences in innovations that resulted in over 18 patent filings, to bring innovative mobile solutions to the world. ConnectAR is a graduate of Eureka Nova incubation programme.